The Jack Rail (aka Jackrail, aka Upper Rail) is the piece that fits in front of the music desk and controls how high the jacks will ascend when a key is pressed and the string is plucked. Consider this diagram, where ‘upper rail’ = ‘jack rail’. Felt is placed on the underside to absorb the impact and deaden any sound that would be created when the jack comes up. After the string is plucked the jack strikes the rail (felt) and descends back to its resting position on the key end. 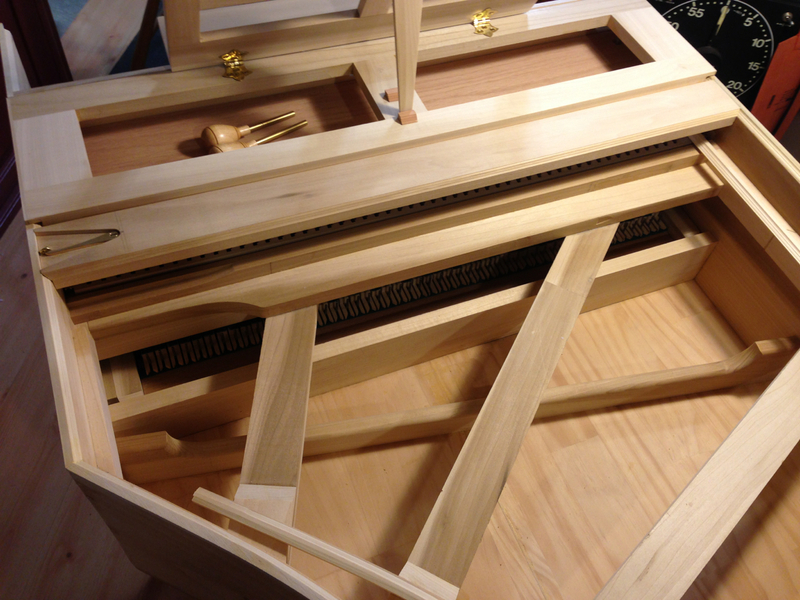 Wikipedia has a great page on the Harpsichord with a very detailed description of the Jack mechanism, which contains a set of diagrams that explains how the jacks work. 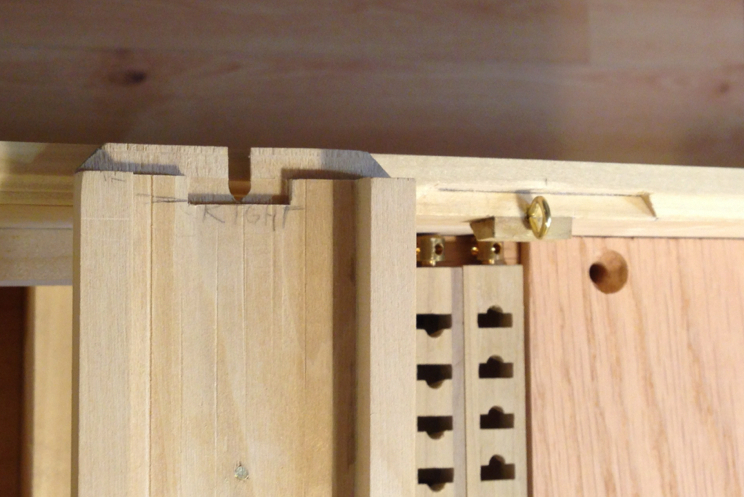 The jack rail is made of poplar, has molded edges and is ‘let’ into the case mouldings on the spine and cheek. To secure the rail there are 2 copper pins on the spine side that fit into the case and a brass hook on the cheek side to lock the rail down. 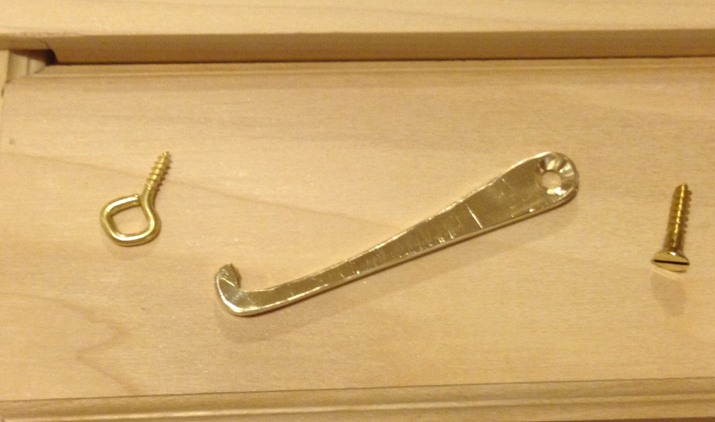 I made a brass hook yesterday out of some heavy 1/8″ stock. It still needs a final polish later when the instrument is complete (it is amazing how the camera picks up the scratches! ), and it is a little longer than the one planned for, but I like the look and feel of it. The installation was a little trickier than the eBook suggested and I had to add a small piece of moulding ‘ledge’ under the rail because the hook’s placement was right on the ‘edge’, which required that I had to create a recess for it for it to fit in the Jack Rail itself. Hopefully the picture explains it. To recess the hook below the surface of the rail I made a router template from a piece of scrap, which only took about 10 minutes, and then ran a test, and it came out really clean. It lined up well, the joint is really tight and the hook even ‘clicks’ a bit when you lock it in place. The following pictures show the hook in both open and closed positions. The hook is installed on the Cheek side, and on the Spine side there are the 2 copper pins that insert into the case that hold the rail in very tightly. And finally that completes the Jackrail, here it is installed.